Benjamin Alire Sáenz (born August 16, 1954) is an American poet, novelist and writer of children's books. 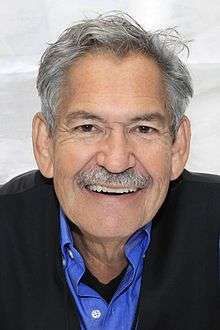 He was born at Old Picacho in Doña Ana County, New Mexico, the fourth of seven children, and was raised on a small farm near Mesilla, New Mexico. He graduated from Las Cruces High School in 1972. That fall, he entered St. Thomas Seminary in Denver, Colorado, where he received a BA degree in humanities and philosophy in 1977. He studied theology at the University of Louvain in Leuven, Belgium from 1977 to 1981. He was a priest for a few years in El Paso, Texas before leaving the order. In 1985, he returned to school, and studied English and creative writing at the University of Texas at El Paso where he earned an MA degree in creative writing. He then spent a year at the University of Iowa as a PhD student in American literature. A year later, he was awarded a Stegner Fellowship. While at Stanford University under the guidance of Denise Levertov, he completed his first book of poems, Calendar of Dust, which won an American Book Award in 1992. He entered the PhD program at Stanford and continued his studies for two more years. Before completing his PhD, he moved back to the border and began teaching at the University of Texas at El Paso in the bilingual MFA program. His first novel, Carry Me Like Water was a saga that brought together the Victorian novel and the Latin American tradition of magic realism, and received much critical attention. In 2005, he curated a show of photographs by Julian Cardona. Sáenz came out as gay in the late 2000s, at age 54. He has acknowledged in interviews that he had difficulty coming to terms with his sexuality due to having been sexually abused as a child, and that he began to explore LGBT themes in his writing in part as a way to help himself work through his own issues with being gay. In The Book of What Remains (Copper Canyon Press, 2010), his fifth book of poems, he writes to the core truth of life's ever-shifting memories. Set along the Mexican border, the contrast between the desert's austere beauty and the brutality of border politics mirrors humanity's capacity for both generosity and cruelty. He continues to teach in the Creative Writing Department at the University of Texas at El Paso. He is the co-host, with Daniel Chacón of the KTEP-produced radio and online show on writers and writing, Words on a Wire. He won the PEN/Faulkner Award for Fiction in 2013 for Everything Begins and Ends at the Kentucky Club, the first Latino writer ever to win the award. He also won two awards at the 2013 Lambda Literary Awards, in the categories of Gay Male Fiction for Everything Begins and Ends at the Kentucky Club and Children’s/Young Adult for Aristotle and Dante Discover the Secrets of the Universe. On July 15, 2014, he was announced as a finalist for the prestigious NSK Neustadt Prize for Children's Literature. Aristotle and Dante Discover the Secrets of the Universe, Stonewall Book Award; Mike Morgan & Larry Romans Children’s and Young Adult Literature Award, 2013; Honor Book, Michael L. Printz Award, 2013; Pura Belpré Award, 2013. Calendar of Dust. Broken Moon Press. 1991. ISBN 978-0-913089-16-3. Dark and Perfect Angels. Cinco Puntos Press. 1995. ISBN 978-0-938317-23-4. Elegies in Blue. Cinco Puntos Press. 2002. ISBN 978-0-938317-64-7. Dreaming the End of War. Copper Canyon Press. 2006. ISBN 978-1-55659-239-3. The Book of What Remains. Copper Canyon Press. 2010. ISBN 978-1-55659-297-3. Flowers for the Broken. Broken Moon Press. 1992. ISBN 978-0-913089-28-6. Everything Begins and Ends at the Kentucky Club. Cinco Puntos Press. 2012. ISBN 9781935955320. The House of Forgetting. HarperCollins. 1997. In Perfect Light. HarperCollins. 2008. ISBN 978-0-06-077921-4. Names on a Map. Harper Perennial. 2008. ISBN 978-0-06-128569-1. Sammy and Juliana in Hollywood. Cinco Puntos Press. 2004. ISBN 978-0-938317-81-4. He Forgot to Say Goodbye. Simon & Schuster Children's Publishing. 2008-06-17. ISBN 978-1-4169-4963-3. A Gift from Papa Diego. Bt Bound. 1999. ISBN 978-0-613-06587-0. Grandma Fina and Her Wonderful Umbrellas. Illustrator Geronimo Garcia. Cinco Puntos Press. 2001. ISBN 978-0-938317-61-6. A Perfect Season for Dreaming, Cinco Puntos Press 2008. Dagoberto Gilb, ed. (2008). "The Unchronicled Death of Your Holy Father; Fences". Hecho en Tejas: An Anthology of Texas-Mexican Literature. UNM Press. ISBN 978-0-8263-4126-6. ↑ Archived July 25, 2011, at the Wayback Machine. 1 2 3 Alire, Benjamin (2013-02-20). "Discovering Sexuality Through Teen Lit". NPR. Retrieved 2014-02-10. ↑ "Copper Canyon Press". Copper Canyon Press. Retrieved 2013-12-04. ↑ "Benjamin Alíre Sáenz". Faculty.utep.edu. Retrieved 2013-12-04. ↑ Archived December 17, 2011, at the Wayback Machine. ↑ "Book of short stories wins PEN/Faulkner prize". Associated Press, March 19, 2013. ↑ "El Paso author Benjamin Alire Sáenz wins PEN/Faulkner Award for Fiction". El Paso Times, March 19, 2013. ↑ "25th annual Lambda Literary Award winners announced". LGBT Weekly, June 4, 2013. ↑ Simpson, Lauren; Davis-Undiano, Robert Con. "Finalists Announced for Prestigious NSK Neustadt Prize for Children's Literature". The Neustadt Prizes. Retrieved 15 July 2014. Wikimedia Commons has media related to Benjamin Alire Sáenz.